We moved our clocks forward and spring is in the air--or is it? This week much of the U.S. received winter storms or a major drop in temps so I chose to feature the cheerful Sunflowers stamp set from Red Rubber Designs to remind us spring really is around the corner! I created a background layer with the Well Defined Backgrounds stamp set which is a large stamp set measuring approx. 4-3/4" x 8". It's so much fun to create a custom background for my projects with the added bonus of never running out of designer paper when I make my own! For the greeting, I used Sophisticated Sentiments and tucked the sentiment layer behind the flower pot to ground the sentiment. 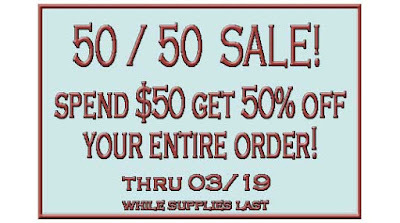 There are just a few days left to get 50% off when you spend $50 so head on over to the Red Rubber Designs store and fill your cart! This yellow distressed panel really stands out against the kraft base, Angela. I like the words background. 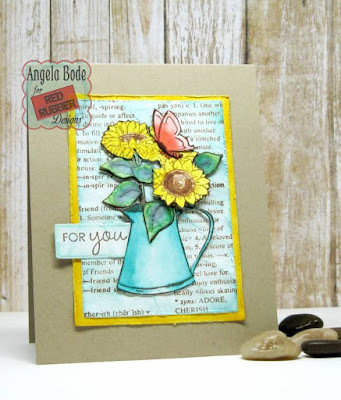 Fantastic stamping and coloring! Great job with the background too!